Tables set and decorated for the best lunch at a scientific conference ever! 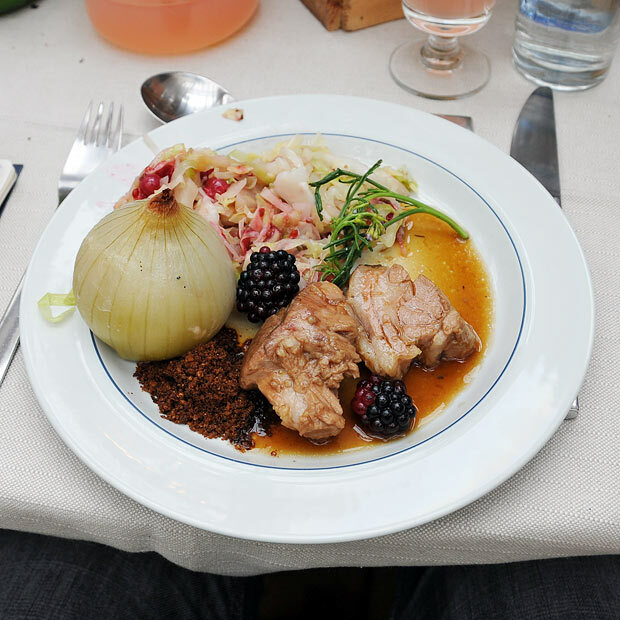 I mentioned in my blog post on “The Emerging Science of Gastrophysics” symposium held at the Royal Danish Academy of Sciences and Letters in Copenhagen that we were treated with what was for me the best conference lunch ever. Later on the same day we even had a chance to visit the Nordic food lab, located on a house boat anchored up in Christianshavn, right next to restaurant noma. 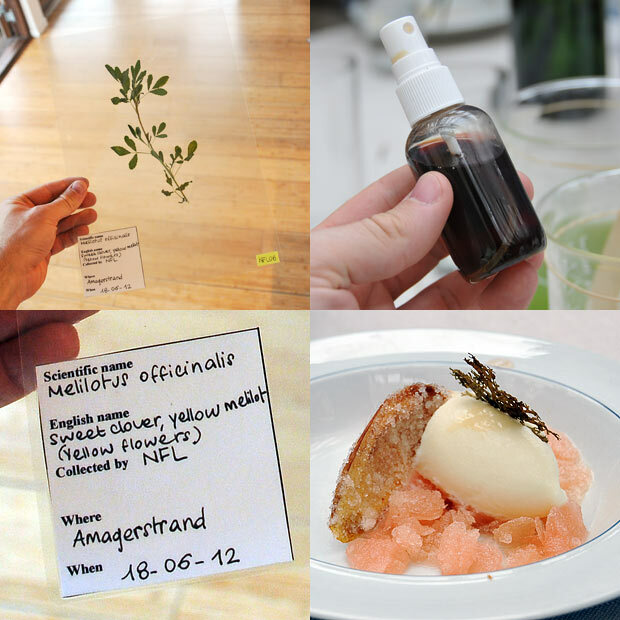 Here are some pictures and impressions from the lunch and the following visit to the Nordic food lab. 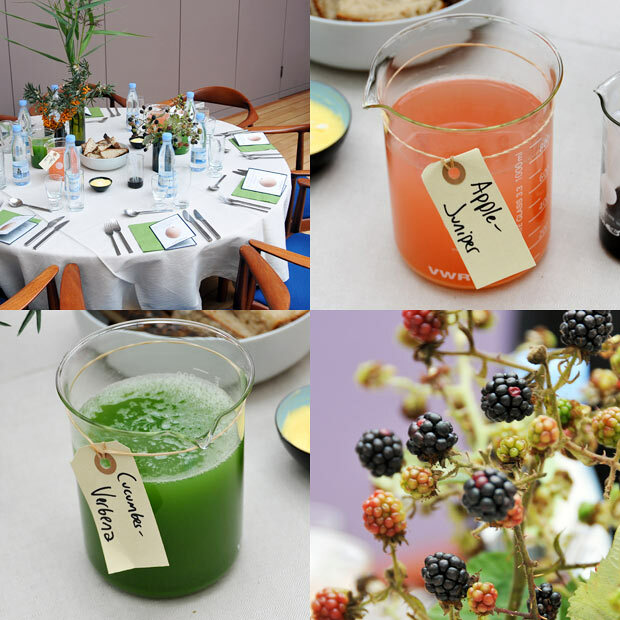 Ben Reade, Head of Culinary Research and Development at Nordic Food Lab, was in charge of the lunch. 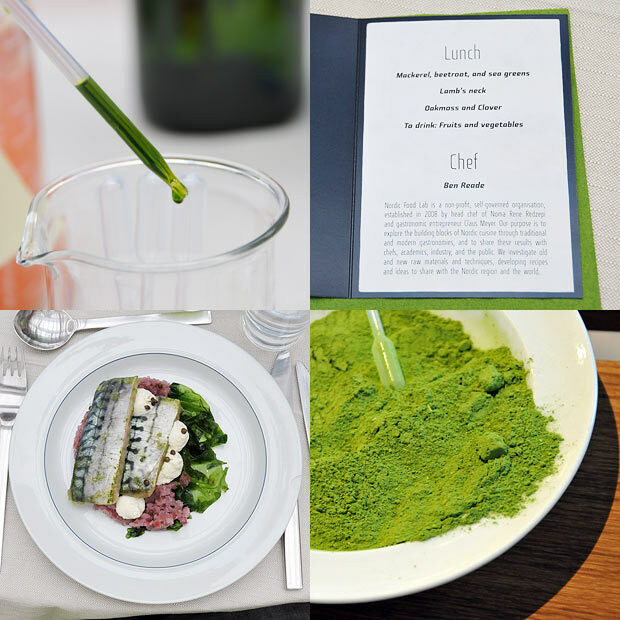 For starters we were served sous-vide mackerel with samphire salt and kelp crisps. With that a Chioggia beetroot tartare, sea lettuce, whipped crí¨me fraí®che infused with horseradish, ramson berry capers and dill oil. Main dish: Lamb’s neck rubbed with yellow pea miso (aka “peaso”), cooked sous vide for 48 h at 62 °C was served with lamb stock, blackberries, and beach mustard. With that an onion braised in milk and spices, filled with walnut potato mash and liquorice rye crumb. On the side summer cabbage with red currants, carrots pickled with white mustard, caraway, and sea-buckthorn. For dessert we were served sweet clover flavored sheep’s milk ice cream with clarified peach ice, pressed oak moss, crystallised peach skin and spruce resin tincture. And just to top it all: the resin for this tincture was collected from a tree struck by lightning! This summer Rachele Ellena, a student from University of Gastronomic Sciences in Italy, visited NFL and helped collect a herbarium of edible plants from the Copenhagen area. A nice summary of the project has been posted on the NFL blog from where the recipe below is also taken. Sweet clover (Melilotus officinalis, shown top left) was one of the plants collected. Sweet clover contains coumarin, a compound with a fragrant aroma, reminiscent of vanilla. Coumarin is also found in several other aromatic plants, including cassia cinnamon, chamomile, woodruff and bison grass (the grass you find in a bottle of Bison grass vodka). It is the coumarin content of tonka beans (seeds from the tree Dipteryx odorata) which made tonka extracts popular for “upgrading” synthetic vanillin. Interestingly the pure compound coumarin has been banned as a food additive in many countries for more than 50 years due to a moderate liver and kidney toxicity. But for an adult a “normal” intake of these plants poses no danger (more details on toxicity and levels here). Infuse the sweet clover in milk at 50 °C for 30 minutes (we put them together under vacuum and into a temperature-controlled water bath). Strain, and dissolve the honey and trimoline into the infused milk. Mix the sheep’s yogurt with the Thick and Easy. Add the infusion to the mix and freeze. 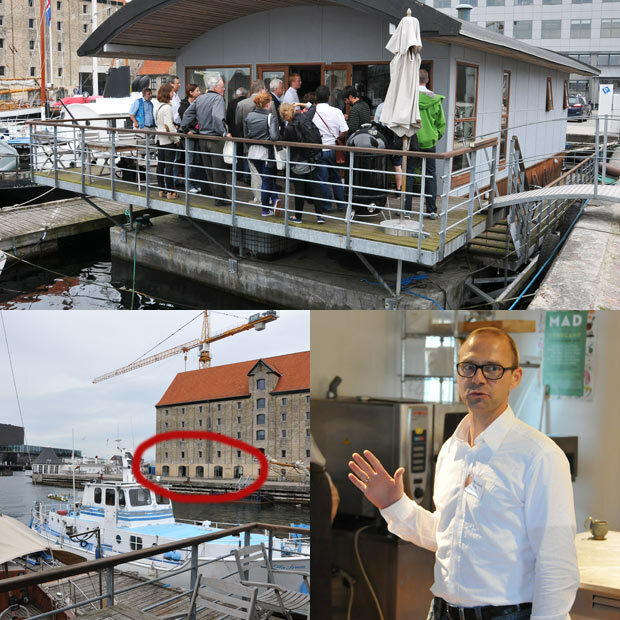 The Nordic food lab is located on a houseboat, right next to restaurant noma (red circle). NFL director Michael Bom Frøst (right) explained how NFL was founded by René Redzepi and Claus Meyer in 2008 with the purpose of exploring Nordic cuisine and it’s building blocks both from a traditional as well as a modern(ist) perspective. 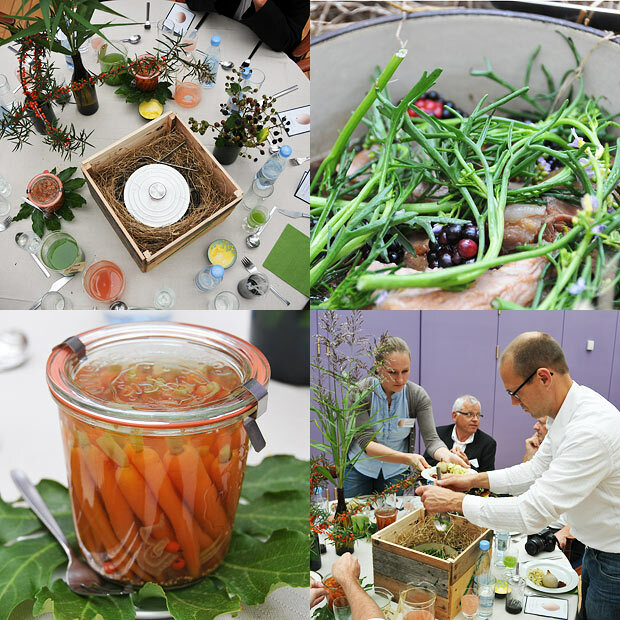 Results are to be shared with chefs, academics, industry and the public. Despite the many links to restaurant noma (their postal address is c/o noma) they are a non-profit, independent organisation. Activities are financed by independent foundations, private companies, and government sources. 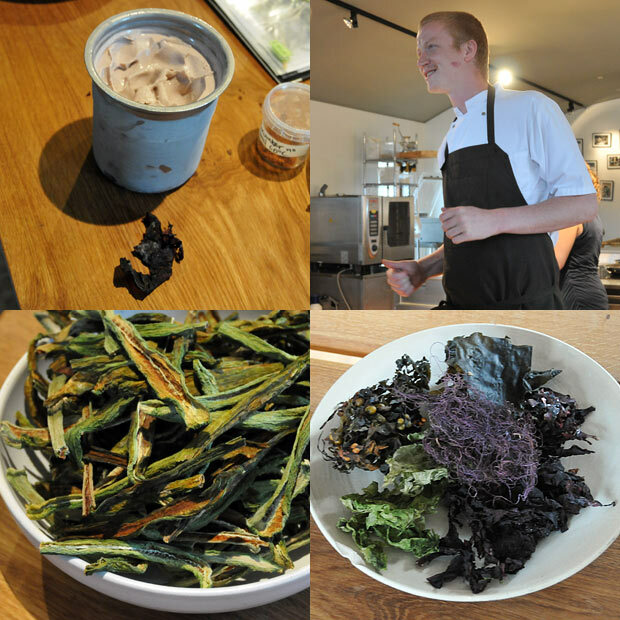 Sea weed ice cream was really delicious! Cucumber dehydrated at 60 °C (bottom left) has an “eastern” flavor when ground to a powder – they’re looking for applications. Different dried sea weeds (bottom right). A hot topic nowadays is fermentation, and NFL have had a great number of fermentation projects. Shown here is barley fermented with the fungi Aspergillus oryzae, perhaps better known as koji. The fungi excretes enzymes which degrade the starch of the steamed barley. These sugars provide the fungi with energy for growth, but also give a sweet taste. In addition pleasant flavor compounds are produced. 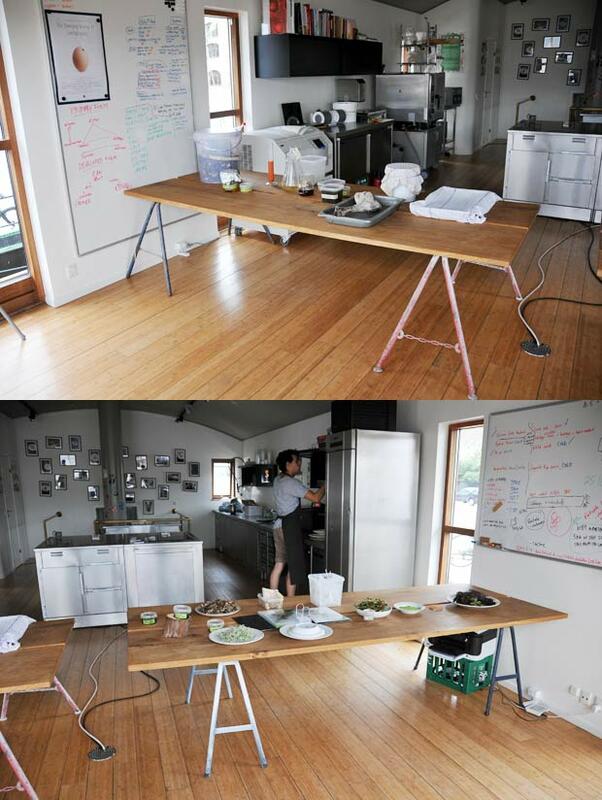 The koji cake (top left) was cut in pieces (top right), fried and served (bottom left) – highly recommended! The greenish hue is a sign that the fungi has sporulated (i.e. formed spores). 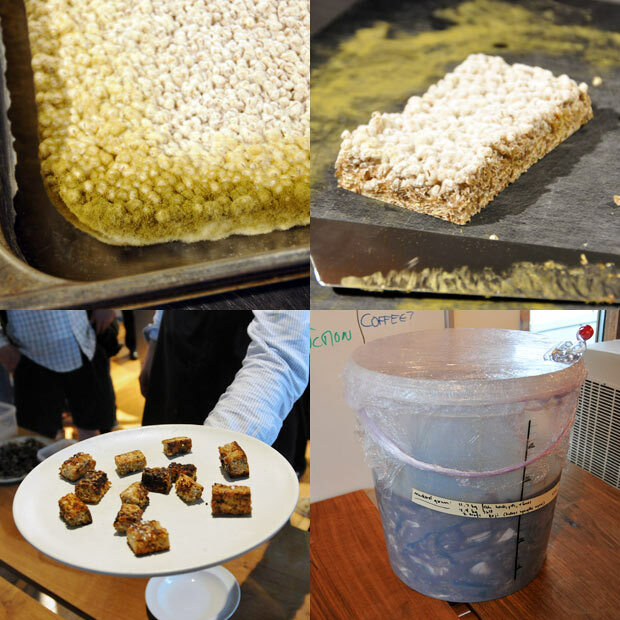 The spores can be collected by dehydrating the barley along the edges, then drizzling spores onto a new “cake” of steamed barley. Koji is fascinating because of its many uses in cooking – ranging from miso to soy sauce and sake. To utilize mackerel heads and bones the people at NFL had started a fermentation with koji as a starter culture in an attempt to make a fermented, reminiscent of the ancient fermented fish sauce garum. Koji has found its way onto noma’s menu as “peaso” (miso made from peas), so if you’re lucky to secure a seat (I was in November, thanks to fellow food blogger Papin at Flavor alchemy!) you may be able to taste it if it’s still on the menu. … and did I mention their blog? Get inspired and start experimenting in your own kitchen by reading about how they make their own vinegars. On the boat they even have small barrels balsamic aging of the vinegar (BTW, if you know about good sources around the world for obtaining a live mother of vinegar, please leave a comment below – I’m sure readers would find that interesting). Great post. And I think you are right, that has to be one of the best conference lunches ever. I wish I had been there. However, the pre-Columbian dinner at the Oxford Food Symposium some time back in the 1990s will live forever in my memory as the greatest conference meal I have ever experienced. Where your purchase a a culture of the fungi? Is it possible to maintain culture and the processes at home (does the process of growth with barley require any special conditions)? I have found that leaving home-made wine (no sulfites) in a gauze-covered jar and swirling it daily will eventually yield up a “mother”. A quicker way may be to purchase some store-bought kombucha. Although there may be other microbial entities associated with this drink, the slimy substance found at the bottom is mainly Acetobacter. I have long suspected that this drink is basically specialized vinegar, and Sandor Katz confirmed this in his latest book, The Art of Fermentation. Placing the slimy dregs of this drink in frequently aerated wine should generate a mother faster than starting with wine only. You can purchase the fungi culture at http://www.brouwmarkt. nl. Click the link and you wil find it. However it´s in Holland so maybe you can find it in your country.